I first returned to Palestine in 2014, working at a local, educational summer camp in Ramallah. I have worked in schools for a decade, and my family is originally from Ramallah, so in the summer of 2014, it was through the lens of an educator that I started exploring my resting Palestinian indigeneity. And, for a while I thought the work of connecting with “my Palestine” lived centrally in Ramallah. It wasn’t until moving here last year, and meeting the Bedouin women of Arab al-Jahaleen, that I realized connecting with people inextricably linked with the land, and closer to our ancestrally rural lineage, was the only way to fasten my personal journey of exploring my roots to the very tangible, daily, and traumatic experience of the ongoing Nakba and occupation of my brothers and sisters living in Palestine today. One one side, the Arab al-Jahaleen Bedouin camp hunkers in the shadow of a large garbage dump near the center of El-Ezariyeh, itself obscured by the jidar (the Seperation Wall) and pock-marked east-Jerusalem that proliferates down the hills to the old city, and on the other shines a crystal-clear, almost magnified, panorama of their original lands, to which they cannot return since today it’s occupied by the 3rd most populous suburban Israeli settlement in the West Bank: Ma’ale Adumim. The callous irony of Jahaleen’s recent history plays in the split screen of the sand and debris slope: Their traditionally nomadic village permanently withers down and the spray of suburbia seeping over their violently unapproachable homeland one short dip away. In the glaring clarity, you can smell the bleach and chlorine from settlement swimming pools slapping against the garbage stench. As a member of the far-removed US diaspora, it was difficult for me to immediately relate this slow-motion calamity to the joy and energy of the Jahaleen women, who drank their morning coffee and ate their evening meals to this backdrop. To me – a sheltered American – it was incredulous. To them, it was 3adi (normal) - their family, children, and homes demanded that life continue. Jahaleen and the women who founded and continue to build the women’s center illuminate the resilience, humanity, and joy that has come to define the greater Palestinian struggle. The women’s center, where we learned language for the summer months, sits in spitting distance of the center of the camp, adjacent to the local school, mosque, and community center, on an intimidatingly steep hill, nearly as sheer as the complexity of the people. It is the center of the village, and the women are the center of the village life. I came to Jahaleen to teach an English class as a volunteer of the Dalia Association, a grassroots organization based in Ramallah. During our English lessons, we used our emerging language skills (their deft English and my amateur - and frankly embarrassing - Arabic) to banter about work, future dreams of travel, and why the heck none of these ajanab were married yet. We talked about their passions, mostly grounded in social work and organizing, and I couldn’t help but notice the stark difference between how the most educated in their society chose work paths that helped uplift their communities while my former college colleagues now work in business, law, and international relations – industries that at their peak financial success breathe life into varied systems of oppression these women face every day. We ate, sometimes sang (mostly John Legend from Youtube), and laughed a lot. They also shared with me their personal stories of forced removal and daily sacrifice. One afternoon, an elder woman – a powerful matriarch of the village – joined us for Maqloubeh (local dish) and celebration. Through traditional Bedouin folk songs, she sang about her childhood herding sheep over the rolling hills for days on end. She remembered her shepherding days fondly, but these gave rise early on to memories of struggle: as a teenage mother, protecting her newly born children from the blows of Israeli soldiers during their forced eviction, while learning how to flourish as the head of a family in a world where her strengths and skills as a strong Bedouin women were not valued. And then we heckled over boxes of Ali Baba(locally made chocolate wafers) about her silly father and his absent-minded, sock-eating goat. The women of Jahaleen are strategic and expertly resourceful. They know what their people need, and they know how to use the same tool to accommodate different supports. The center for instance serves a variety of layered functions: a place to organize through lunches, to exchange cultural traditions with foreigners, to teach their children, and to embrace well-needed respite from the summer sun and winter wind. They are relentlessly warm and welcoming. My helpless language skills were always met with smiles, and an embrace of “your Arabic is very good.” And each day, regardless of their daily struggles or family drama, they kept showing up ready to engage. The children showed up the same curious, kind way. Towards the end of our lessons, there were always a group of 3-10 kiddos congregating outside the door, wondering who in the heavens was throwing around these ridiculous dad jokes. The children surprised me with their developed English skills. Yet, because our experiences of education – mine from a formal classroom, and theirs seamlessly adjoined with the ebb and flow of their daily lives – were so different, I struggled to find the right supports. I very slowly learned to give up more traditional forms of structure and find ways of tapping into the spirit and forms of Jahaleen that mattered to them. 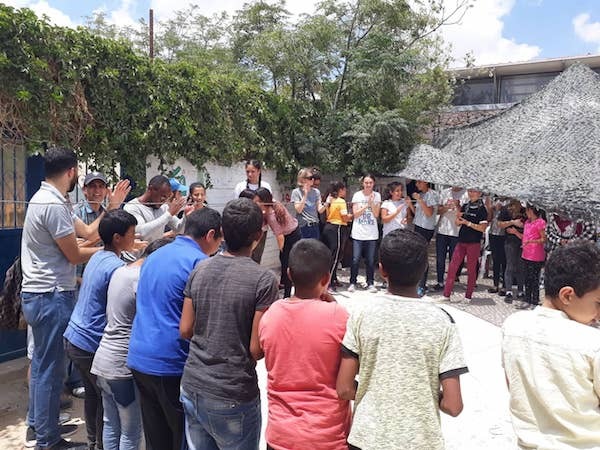 After my time as a teacher finished, I felt compelled to return to Jahaleen, first as a camp coordinator with a large group of wide-eyed, middle school students from Ramallah, then as a friend. It was, and still is, impossible to walk away from a group of young people so warm and welcoming, and equally as insightful and tenacious, without returning to catch up. I’m looking to continue building my relationship with the amazing people of Jahaleen into the next leg of my experience here in Palestine. Meeting the people of Jahaleen, learning language with them, and hearing their stories has thus far been my most impactful experience in Palestine. As I continue to explore my own Palestinian identity, the women of Jahaleen stand as a powerfully beautiful yoke tying together the endemic, bucolic heritage from which we all emerged to the strength of adaptation and evolution Palestinians are forced to develop in the tumultuous and frequently tragic reality they face. The vitality of the Jahaleen is a compass for the rest of us to develop blueprints of resistance, their memory a mighty reminder of who we are despite our attempt to flee the trauma living in our humanity, and their resolve a call to action that ripples our Palestinian blood. Jahaleen is my Palestine, and my Palestine is theirs. 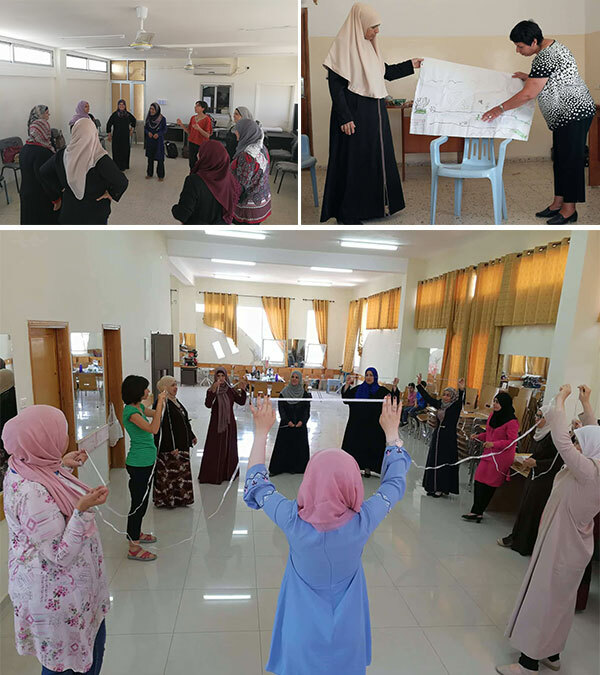 We continued the creative thinking and teamwork trainings with local artist Riham Isaac, which were held with the Salfit, Ramallah, and Jericho women funds. These, will later enable the women to collaborate to come up with solutions and initiatives for their constantly changing needs and priorities. 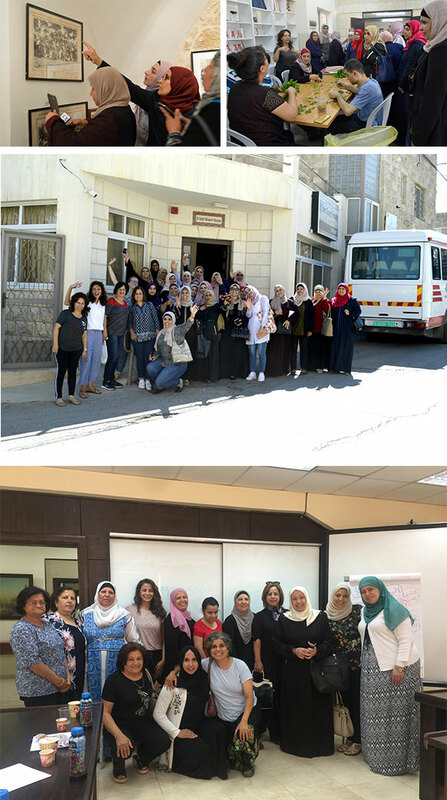 We also organized a field visit for the women members in the five women funds: Tulkarem, Jericho, Ramallah, Salfit, and Jenin. We visited the Arab Women's Union-Bethlehem, and we learnt about their work, especially on how they cooperate with Sunbula to sell their embroidery works. We also visited the Arab Women Union-Beit Sahour, and saw their works with women, children and persons with disabilities. We ate delicious meals from their kitchen, and we got to know how they cooperate with Masar Ibrahim Al Khalil through their guest house. We also organized a mujawara (convening) with Nisreen Musleh, CEO of Ritaj Managerial Solutions, for the members of the women funds, young women grant recipients from the IBDA’ youth program, and other active women associations. She provided us with a talk on her experience being a women entrepreneur, and offered advice in establishing successful initiatives. As you all may know, we believe that community giving is an important element in achieving durable development, and this community giving can vary in type, such as cash and non-cash resources. We also believe that when we are practicing community giving we are enjoying it, because in the end the benefits will disburse to us all. That is why we fun-raise and not Fund-raise. In July and August, we held multiple fun-raising activities to provide scholarships for the Education Fund in partnership with Esnad for Student Support. We introduced the Smiling Station: a mobile initiative to face paint and draw smiles on children’s faces (and adults) to collect donations for our funds and activities, and this time it was for the education fund. 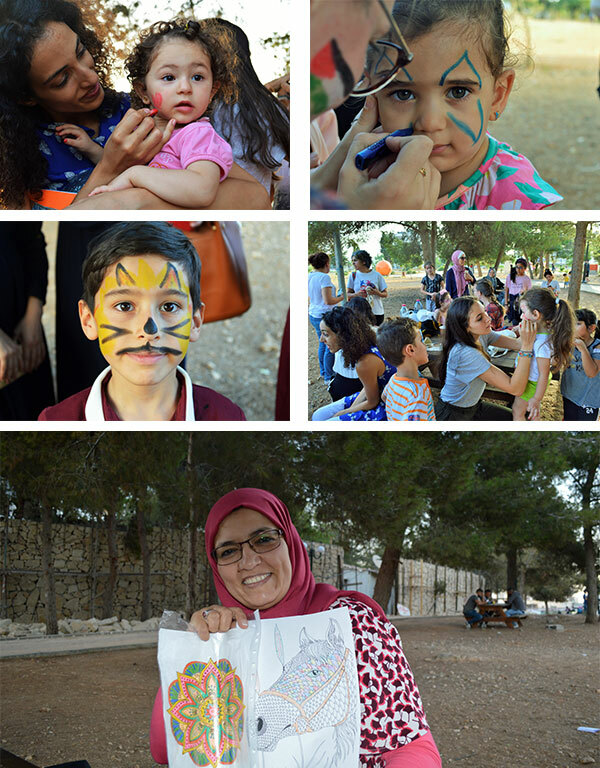 Not only that, our board member, Hekmat Bessiso, joined us in a fun-raising activity of her own: Doodle for Change, as she also believes in the importance of community giving in achieving a durable development in Palestine. You can do an activity yourself from our fun-raising toolkit, especially if you believe in our rights as Palestinians to control our own durable development. We would like to thank all the volunteers, donors from all ages, and fun-raisers for believing in our mission and vision! Every summer the Ramallah Friends School organizes a summer camp for Diaspora Palestinian youth under the name Go Palestine. 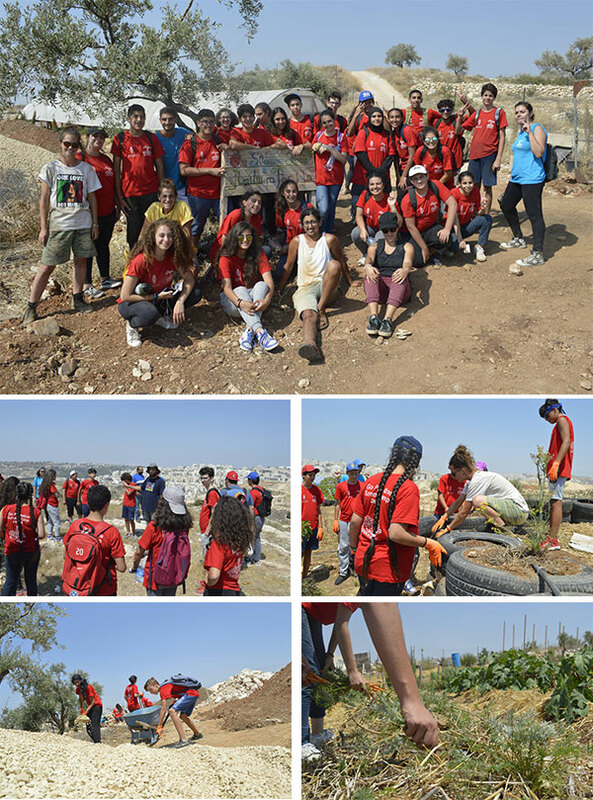 We collaborated with them to organize a volunteer day at the Om Sleiman farm in Bil’in, a farm that uses a community supported agriculture method. Moreover, the Ramallah Friends school has since 2011 been offering English and SAT prep summer programs, investing in fostering the students’ critical consciousness. With this in mind, we gave the participants and their teachers a talk on the importance of community- controlled development in Palestine, and the work we do at Dalia. We executed our first Diaspora Solidarity Program in partnership with To Be There, from July 1st to July 10th. During these 10 days, the participants learned about the political reality of Palestinians living under occupation and volunteered in various local communities. The following article is a contribution from a participant. Thanks to a Palestinian friend who lives in Belgium, I got introduced to the Dalia Association and the Diaspora Solidarity Program. Since many years it had been a dream to visit Palestine, though it sounds rather contradictory, having a wish to visit occupied territories. The time seemed right so I decided to give it a go with this program. Traveling with Dalia Association means international encounters, which is a real plus. You don’t leave from your home country with an entire group of nationals. You get to meet so many people from all over the world. It is nice to broaden your horizons with opinions and knowledge from other people who come from all over the world, France, Norway, the USA, England, Tunisia, Egypt etc.